Smart healthcare organizations will select a dictation process designed to promote physician workflow and clean documentation. Back-end speech recognition systems are gaining popularity as healthcare organizations across the country invest in these technology platforms to leverage their ability to create cost-efficiencies without interrupting physician workflow. 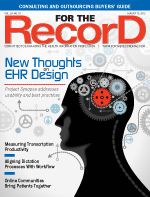 “Everyone seems to be transitioning to back-end speech recognition,” says Sherry Roth, PA-C, DF-AAPA, CMT, AHDI-F, a physician assistant since 1982 and a medical transcriptionist (MT) since 1992, who adds that most healthcare organizations would like to make the move to front-end speech recognition based on the thinking that much of transcription could then be eliminated. However, reality suggests that many physicians would be too resistant to such a major change in workflow. Unlike front-end speech recognition processes that generate dictated text on a computer screen in real time, requiring physicians to edit documents themselves, back-end speech recognition is invisible to physicians. Dictation processes may appear no different from traditional methods, as physicians speak directly into microphones and the language is processed in the background by the speech recognition server. Once dictation is completed, an MT edits and finalizes the document. While back-end speech recognition may seem an effective and efficient solution, Roth notes that sometimes physicians are not aware of which method is being used or why it would be beneficial to have this information at their disposal. Specifically, some poor dictation habits that have been cleaned up by MTs in the past will create inefficiencies with speech recognition in that it will require more editing and follow-up to produce a clean document. Brenda Hurley, CMT, AHDI-F, a 40-year industry veteran with expertise in transcription, management, education, and compliance, points out that for decades healthcare professionals accepted sloppy dictation practices because there was an MT available to make corrections. “Now those problematic dictators are taking steps to improve because they are getting pressure from the top,” she notes, adding that poor dictation habits impact quality and can limit the financial benefits of speech recognition technology. van Terheyden says success often comes down to training and how an organization rolls out the technology. “Physicians have not been trained with back end because they are separated from that process,” he says. According to the US Bureau of Labor Statistics, the healthcare documentation industry is expected to grow by 25% over the next 10 years, primarily due to a large aging population that will require more healthcare services. To best position a healthcare organization to meet this demand, van Terheyden suggests various documentation methods may need to be used: traditional transcription, back-end speech recognition, front-end speech recognition, and direct EMR-based documentation. Rule No. 1, he says, is to offer options and choices because there are pros and cons to every choice. Many organizations are finding that the effectiveness of the dictation method—whether traditional, front end, or back end—largely depends on environment and specialty. For example, front-end speech recognition is a great alternative when transcription turnaround times aren’t urgent, such as weekends. van Terheyden says specialties such as psychiatry require more than the usual amount of descriptive narrative, making front-end speech recognition much more cumbersome for the physician. The obvious benefits of using back-end speech recognition for dictation as opposed to traditional methods are the cost-efficiencies created by eliminating the need and scope of transcription services and the increased probability of documents being delivered on time. In contrast, when an MT is building a document from scratch, it is much easier for mistakes to be caught and corrected. “A transcriptionist may be able to pick it out and figure it out. Not speech recognition,” Roth explains. van Terheyden concurs, adding that an MT will often have a personal relationship with a physician and thus will be better equipped to understand what is being dictated. However, there is the downside of additional expenses incurred for transcription plus the possibility of delays in getting finalized documents started in the revenue cycle. There is also a lack of opportunity for real-time feedback, such as alerts and clinical decision support, that may be offered through an EHR. For this reason, many industry professionals point to the promise of front-end speech recognition. Hurley says many MTs are overcoming a learning curve regarding editing techniques. “Unlike traditional transcription, where you start from scratch and create a document, the transcriptionist takes on a new skill, which is one they haven’t used before: editing,” she says. Across the board, industry professionals agree that many of the best practices for dictating into back-end speech recognition technology are the same as what would be suggested for traditional dictation techniques. The primary difference is that speech recognition is much less forgiving to mistakes and sloppy practices than an MT. Hurley mentions three factors that can make a huge difference: good dictation habits, well-organized thoughts and notes, and the location where the dictation occurs. “The same factors can improve traditional transcription methods as well,” she notes. Location and limited distractions are also crucial to the process. Best practices suggest that a quiet location away from interruptions—that includes both people and devices—is optimum. A recent study published in the Journal of the American Medical Informatics Association found that quality of care was actually heightened when dictation methods were replaced with structured documentation methods. Researchers evaluated 15 quality measures of care for patients with coronary artery disease and diabetes. The study encompassed 18,569 visits by 7,000 patients. The 234 participating doctors used various documentation methods: 20 (9%) dictated their notes, 68 (29%) used structured documentation, and 146 (62%) typed free-text notes. Traditional dictation was used via telephone, where a third-party medical transcriptionist fed the information into the EHR. Structured documentation entailed the use of templates that divided the patient visit note into separate sections for the doctor to fill in. The other method involved doctors typing free-text notes into a single window. According to Jeffrey Linder, MD, lead study author and an associate professor of medicine at Harvard Medical School and an associate physician at Brigham and Women’s Hospital in Boston, the quality of care was higher for three measures (blood pressure documentation, body mass index documentation, and diabetic foot exam) for the physicians who used structured documentation. The study also revealed that quality of care was significantly better for both structured documentation and free-text methods for antiplatelet medication, tobacco use documentation, and diabetic eye exam. Linder believes front-end speech recognition technology holds more opportunity for better quality of care because physicians are more likely to see and respond to alerts if they are using an EHR.